This post is sponsored by Sugru . All opinions are my own. My girls have been dying to update their room for a while now and I’ve been getting sick of untangling their necklace heaps and knew we needed to come up with a better storage than a pile of necklaces on their dresser top. We came up with a project that would update their room, fix the jewelry problem and be fun to work on together! 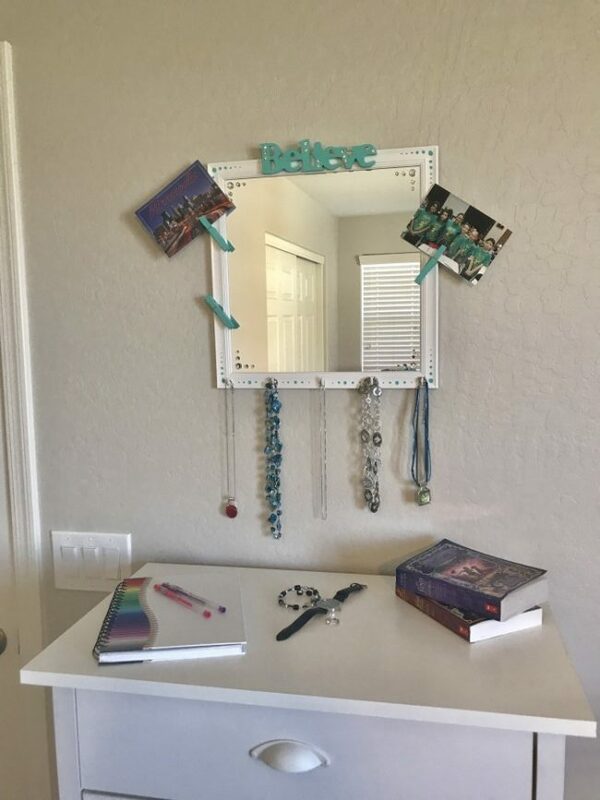 We thought, why not BLING up a bedroom mirror and add some jewelry hooks to the bottom of it to keep their necklaces tangle-free! 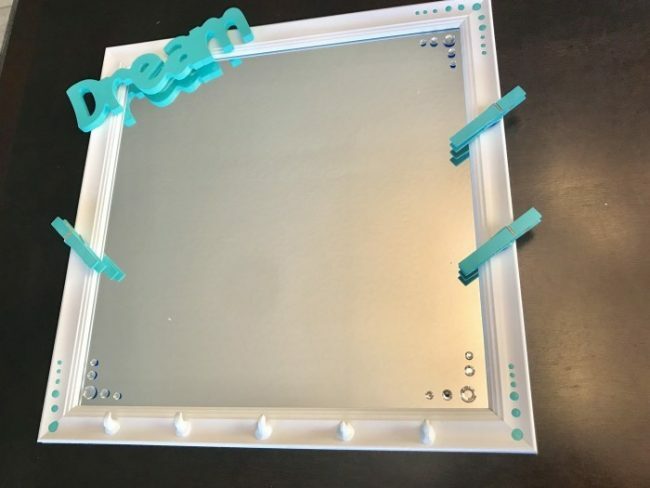 Check out our DIY Mirrored Jewelry Organizer below to see how we did it! 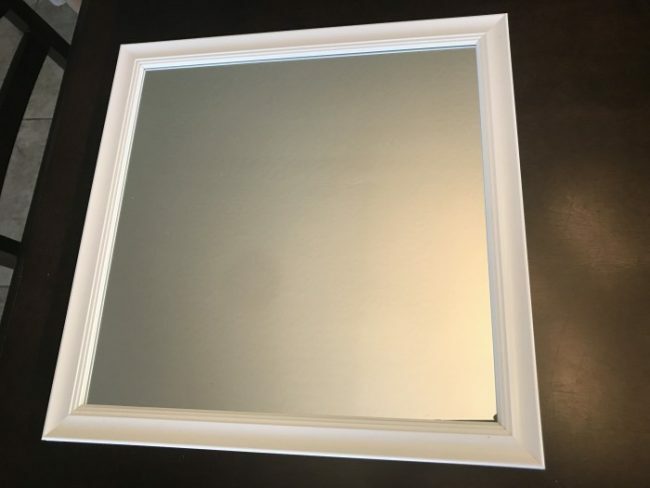 We started out with a plain white, plastic-framed mirror. Nothing spectacular. We went to our local craft store to pick up some things to personalize the mirror. We got some cute wooden words to add, some metal backed rhinestones, paint and clothespins. 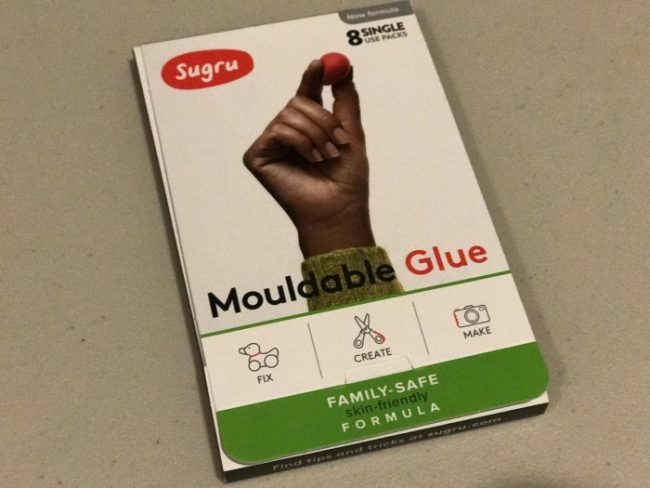 We were trying to connect all sorts of materials together, so we needed a glue that would bond to almost anything, yet be safe so my kids could also work on the project: Sugru . Sugru is a moldable glue that is absolutely amazing! It comes in a packet and looks and feels a bit like clay, but you can shape it and mold it to fit almost anything. 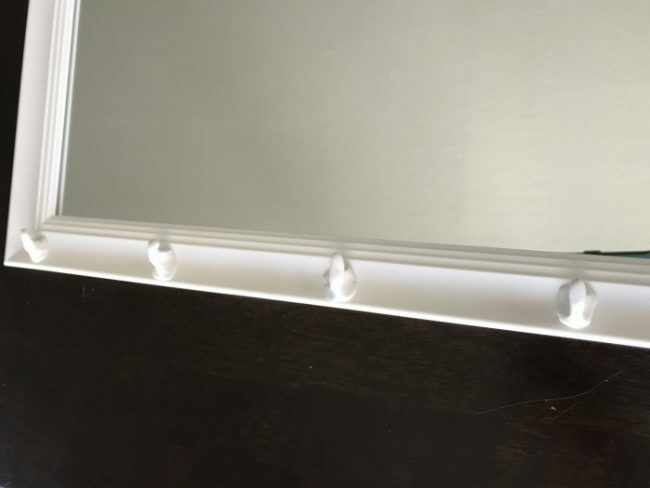 We were originally looking for some hooks to add to the bottom of the mirror for the jewelry storage, but couldn’t find any that we liked, and I saw that we could use Sugru to create our own hooks! 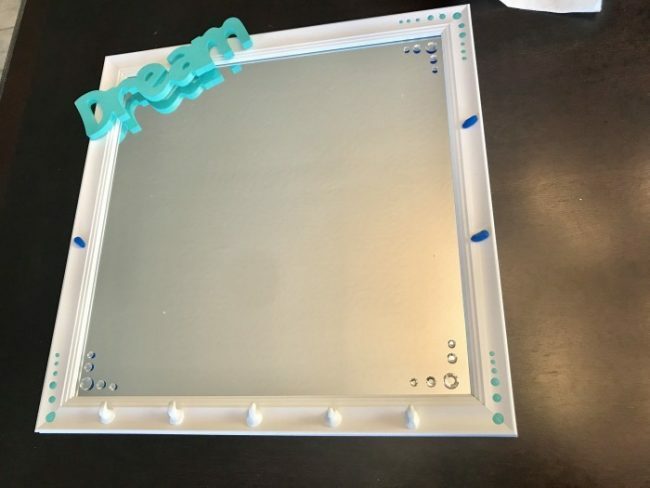 My girls loved molding the glue and sticking it to form the jewelry hooks where they wanted, and the great part is that you can’t make a mistake! If they molded a hook and didn’t like where they placed it, or how it looked, they have about 45 minutes to remake it before it starts to set! So once the Sugru started to set after about 45 minutes, it took 24hrs before it completely cured and turned into a soft semi-flexible rubber that worked perfect for what we wanted! The Sugru came in 5 colors, I personally loved the yellow, but since it was my girls’ mirrors, they both chose to do their hooks in white. It’s easy enough to color match the Sugru to any object by mixing and kneading together the right shades as well. You’d be surprised at how far a little bit of Sugru goes, and how easy it is to work with and clean up afterwards. Once we got our hooks how we wanted them, we added a bit of color and bling to the frame with paint and rhinestones. We stuck the rhinestones on using Sugru as well. Just a small ball of Sugru on the metal backing of each stone stuck to the glass mirror perfectly. We decided to add some painted clothespins to hold up pictures/postcards/quotes/etc., and used Sugru to bond the wooden clothespins to the plastic frame. I was concerned that the clothespins wouldn’t hold tight to the frame, but the Sugru kept it bonded tightly even while opening and closing the clothespins. Both my girls’ mirrors turned out pretty similar which made me laugh because my girls are quite different from each other. 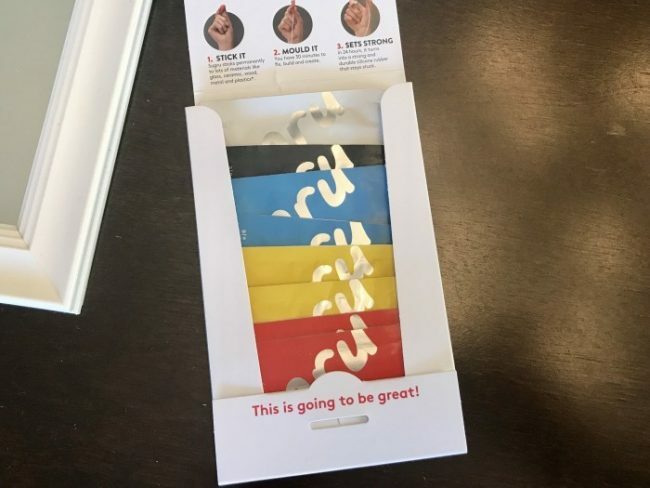 Of course they can, and probably will, change their minds at some point so it’s great to see that Sugru is actually removable using a knife (with adult supervision of course). They both like having their own area to keep their jewelry organized and check their hair/make-up in their room. We all LOVE how it turned out and were so grateful at the versatility that Sugru had to do this project. I am amazed at all that Sugru can do ! We got onto the Sugru website and found a ton of craft projects that we’re going to try with some of the extra packets of Sugru that we have left over. 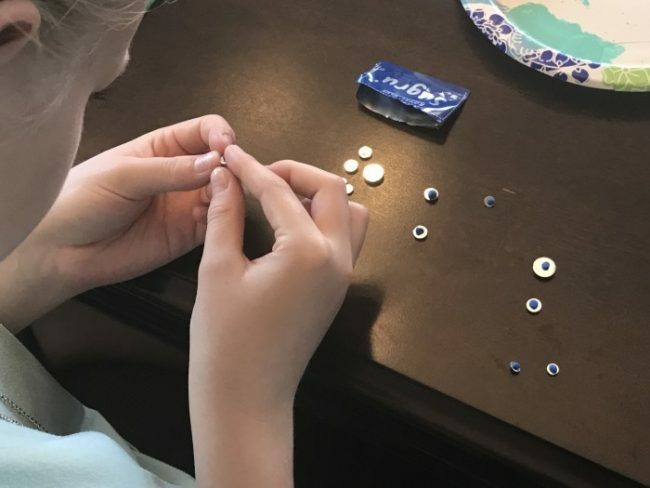 It was so easy for my kids to work with, easy to clean up, and bonded to all the different mediums fabulously. 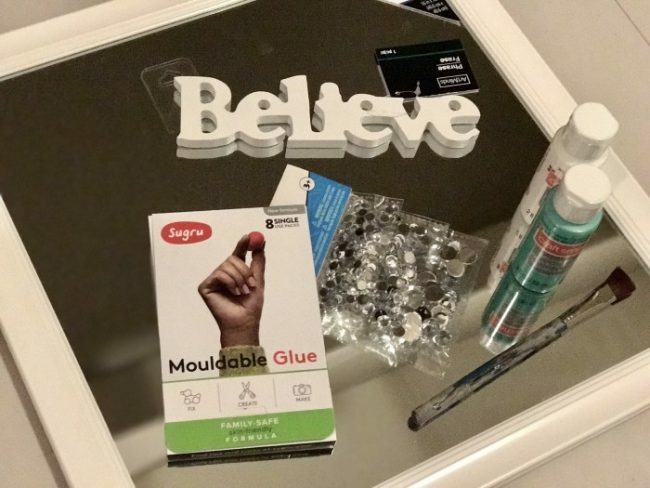 For more product inspiration and to see all the different things that Sugru can do, check out these great ideas with Sugru! This is an amazing DIY. Managing jewellery is always been a hectic task. This is such a great idea for a jewelry organizer! I am going to have to give this a go! I LOVE the choices of colours you used! This is super creative. This jewelry organizer is so cute! Saving this idea for when my girls are a bit older. 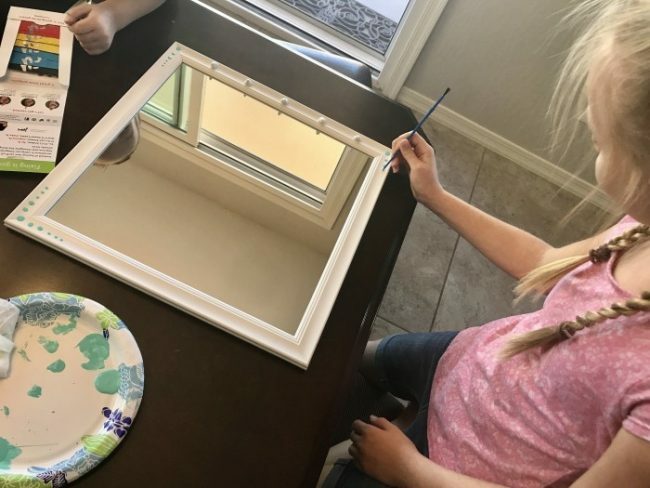 This is perfect for my niece, what an adorable idea! So useful. I love this idea. I’m sure both of my daughters would love one of them in their rooms. I’ll have to get the supplies so they can make their own. What a smart idea! I have a walk in closet, and I’d like to add this to it! Very cute. This is going to be perfect for my Daughter. I will have to get the supplies I need to make one for her this weekend. So perfect and cute for a kid’s room and a great way to keep everything organized. Oh these are so impressive. I’m liking the way you designed each frame! Awesome idea for a gift! This is so cute! 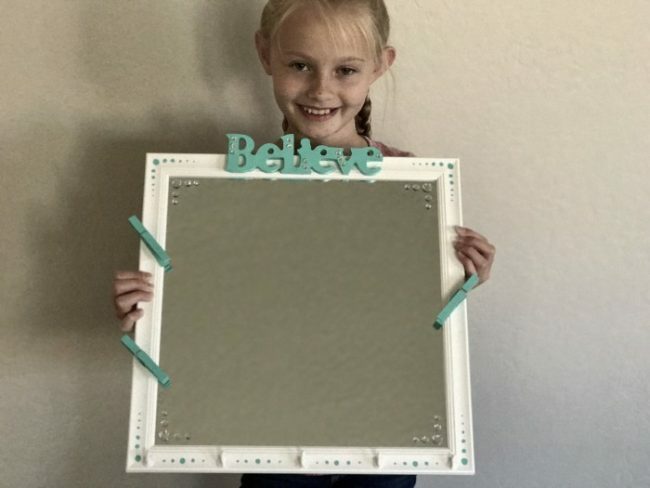 I want to make one for me and one for my daughter. SO cute! Being a crafter at heart means this makes my heart go a-flutter! Thank you for letting me know about this. I know somebody that would love this. There’s a little girl that I watch and she is very creative and loves to decorate stuff. She would love this for that reason alone. Very cute project and serves the purpose to organize and modify a girls room. I love the clothespins and picture idea. That is so totally adorable! It’s a lot easier that I thought it would be, too! That is super cute! I would love to do one of these for each of my daughter’s rooms. This is so creative and would look so cute in a little girls room. My niece would go crazy over this!! That is just precious! I love the color choices you used, too – and the clips on the side is so clever!